Cut the tops off the tomatoes, scoop out the inside with a teaspoon and discard. Place upside down on a piece of kitchen paper to drain. Cook the quinoa according to the packet instructions, then remove the lid and allow to cool. To make the dressing, crush the garlic clove with the blade of your knife and pop it into a clean jar with the lemon juice and olive oil. Add a pinch of salt and pepper, screw the lid on tightly and shake vigorously to mix. Add the cherry tomatoes to the cooled quinoa along with the spring onions, cucumber, fresh herbs and spices and mix gently. Remove the garlic clove from the dressing and discard. Use about half the dressing on the salad, adding more to taste. Any leftover dressing can be refrigerated and will keep for a few days. 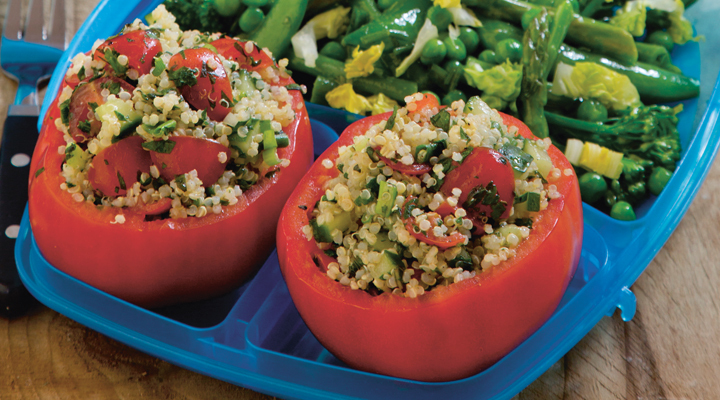 Fill the tomatoes with the tabbouleh. This can be made a day ahead and refrigerated.